A subsidiary of Godin, Seagull produces a fine selection of wonderful mid-range models that always feel like special instruments. Perhaps that’s because they are quite special! Made in Canada, made with quality solid woods, and not costing the earth. The brand’s popular Artist Mosaic is prime example of this, coming in at under $1000 but promising a lot more. The Artist Mosaic sports an inherently simple design, but one that shows glimmers of premium. It features a 25.5” scale length dreadnought style body that is made of beautifully-grained solid woods – there’s solid mahogany on the back and sides, capped with a pressure-tested cedar and all finished in an elegant custom polished semi-gloss. The detailing around the body is exquisite, showing off herringbone binding, while the neck is another big highlight. This matches the body with a mahogany construction, joined at the 14th fret. This features a dual-action truss rod, a rosewood fretboard with a 1.8” nut width, and offset dot inlays with a distinctive flying seagull inlay at the 12th fret. Another distinctive addition to this model – as is the case with all Seagulls – is the tapered headstock, which looks cool and benefits tuning stability. For a sub-$1000 guitar made in North America, the craftsmanship is expectedly excellent and its setup is solid. Seagull does not fail to impress in the hardware department either. There are versions of the Artist Mosaic with a pickup system (look for the Artist Mosaic Element), but this original model features no electronics. It does, however, feature a very good set of Seagull-designed tuners with lovely cream buttons, along with a GraphTech Tusq nut and compensated saddle sitting on the rosewood bridge. Another fine addition is the deluxe TRIC hardshell case, which proves a great companion for storage and transport, as it’s been tested in extreme conditions and temperatures, as well as being highly resistant to impact (because we’ve all had that heart-stopping moment as we drop a guitar case!). Moving onto sound and this is another area that would sell us the Artist Mosaic. The combination of solid cedar and mahogany naturally makes this model very sweet and warm in tone, while it really sings in terms of volume and resonance. The best news – as the years go by, the all-solid-wood body will open even further, leaving you with an acoustic that grows in warmth and volume. Wonderful. AWe love the Seagull Artist Mosaic. For under $1,000 this will be a considerable investment for many guitarists, but it’s one worth making – or at least considering. The build quality, elegant style and wonderful tone are well within the territory of Martin and Taylor guitars, but because you aren’t paying for the bigger name, you end up with a model offering superb value. For more info about the Seagull Artist Mosaic , click here. 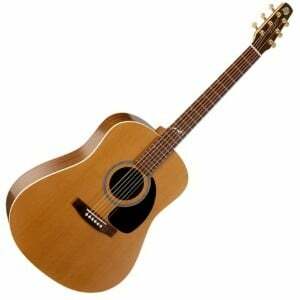 For more acoustic guitars for less then 1000$, click here. I have a vintage Artist Mosaic. I purchased it in 2005 from Troll music in Venice Fl. I walked in one day, they just started selling the seagulls line. Godin sent them an FS ( Factory Second) by mistake, it had a tiny little blemish on it. Anyway, I got it for 450.00 and won’t give it up. Pure sound and playability forever. I don’t know how far back they made these, but the artist mosaic is a wonderful guitar.. Thank you! I own a Seagull Artist Studio and a Performer. I would agree totally they compete on every level with instruments three times the price. The Artist in particular has solid Rosewood back and sides and Spruce top, with Ebony fretboard and bridge and a Mahogany neck. The Artist (and previously the Performer) has been gigged regularly and offers great playability and excellent amplification. Great website and thanks. Just a heads up, and only because it is an important spec and should be stated correctly. As per the Seagull support Rep, the Artist Mosaic as of 2017 comes with a resin composite Ritchlite fingerboard and bridge not Rosewood. I have a few Seagull and Simon and Patrick acoustic guitars… okay I have 6…and my husband wants me to downsize. So I am always going into the shop and playing the Taylors and Martin’s trying to find 1, that I would trade my Godin acoustics in for… Nope… the value and quality of these guitars is INCREDIBLE.. and I can have a mini-jumbo, spruce dread, mahogany dread, concert, folk and parlor guitars for the price of 1 of the others. I can’t stress the quality of each and every one of these guitars. The only pain is that they aren’t easy to find in shops to try. All mine were purchased blind. AFter the first one, I figured there were no worries.. and there hasn’t been. EAch of them are fantastic. ADORE!